« Join us for a Hope Program Open House in Cincinnati! Through the generous support of a family in the US, Milagros is able to go to school. Milagros is a compassionate, intelligent, and confident teenager who lives in the Rio community, an impoverished community that Back2Back serves. Her name means “Miracle” and often she is nothing shy of that! She was born deaf and grew up communicating with her self-made sign language. One of the things I love most about Milagros is her fearless ability to try. She will attempt over and over to communicate with me despite my sometimes baffled looks. Milagros is very determined. She knows what she wants and what she is capable of and sets out to do it. I like that in a person who would have an easy excuse to do nothing at all. About a year or so ago a family came down on a Back2Back mission trip, met Milagros, and had a heart to help her. With their support, she was able to attend a school for the deaf where she learned sign language and some trade crafts. Not satisfied with just this education, Milagros approached us a few months ago with a flyer from a cosmetology school over in the next neighborhood. We met with the director of the school, who was eager to take on Milagros with her challenges. 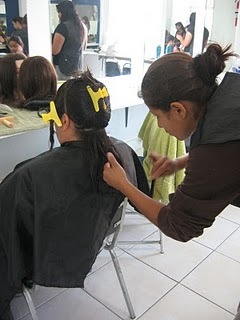 Milagros has now been enrolled in cosmetology school for several months. Just a few days ago, I had the privilege to go with a co-worker to Milagros’ school to see her in action. 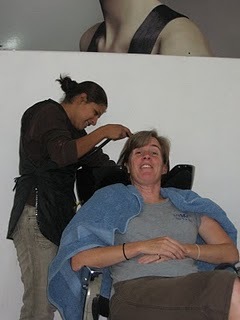 There, Back2Back staff member, Cathy Huffer, got a trim and Milagros gave her mom some new layers in her hair. It is nothing less than a miracle to see someone like Milagros, born with limitations and into an impoverished community, grow, thrive, and pursue what some would say is impossible. This entry was posted on April 30, 2010 at 9:00 am and is filed under Mexico, News. You can follow any responses to this entry through the RSS 2.0 feed. You can leave a response, or trackback from your own site.